The price of this exceptional all-inclusive, small-group tour is £6,995 per person. Single room supplement of £875 for the trip for anyone wishing to have a single room. Please see our Terms and Conditions for the full details. To book your place or to ask for more details, please email Alan and Ruth on info@birdwatchingtrips.co.uk or call us +44 (0)1492 872407. Uganda is where the East African savannah meets the bird-rich West African jungle. Where else but in this impossibly lush country can we see Lions prowling the open plains in the morning and track chimpanzees through the rainforest undergrowth the same afternoon, then the next day navigate tropical channels teeming with Hippopotamus and huge crocodiles before setting off into the misty mountains to stare deep into the eyes of a Mountain Gorilla? Not to mention canoeing through the pristine swamps to look for the enigmatic Shoebill. Uganda is safe and delightfully friendly, and with wonderful lodges and excellent local guides, it offers exceptional wildlife-watching. 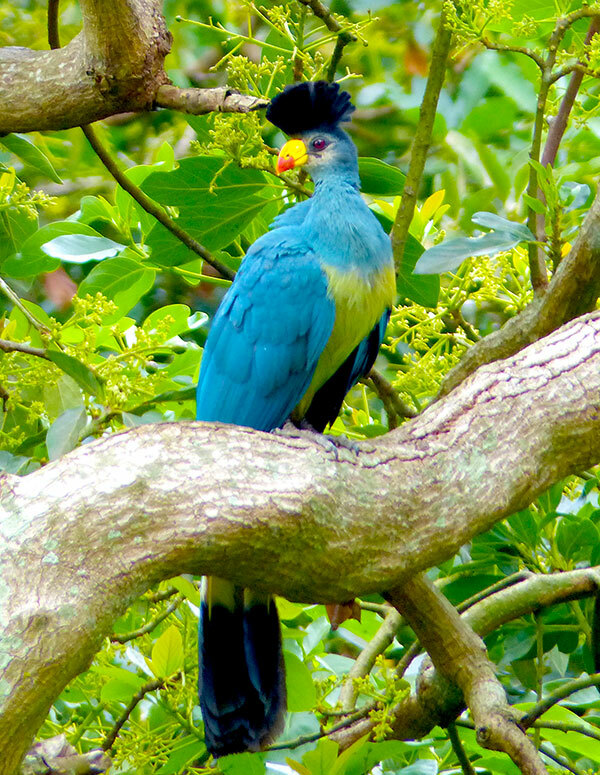 We can expect to enjoy over 400 species of bird and 40 mammal species on our small group, two-week tour. With only six participants and three guides, and all tracking permits already included in our all-inclusive tour, we can promise you an exceptional experience as you enjoy some of the very best wildlife the African continent has to offer. Our tour starts at Entebbe Airport where your flight to Uganda will be met and you are transferred to our very comfortable hotel overlooking Lake Victoria. Overnight in our comfortable hotel. Today we’ll enjoy a boat trip and wildlife drive in our first of many national parks, Lake Mburo. This park has varied habitats from open Acacia woodlands, to a number of papyrus-lined lakes and swamps. Some of the many species we’ll be looking for today include African Finfoot; Palm-nut and White-backed Vultures; Wahlberg’s and African Fish Eagles; Grey Crowned Crane; Senegal, Crowned, and Wattled Lapwings; Great Blue Turaco; Woodland Kingfisher; Lilac-breasted and Broad-billed Rollers; African Grey, Crowned, and Black-and-white Casqued Hornbills; and Greater Blue-eared, Splendid, Rüppell’s Long-tailed Starlings, Mammals will be a large part of our visit to this park, and the many species we might see include the shy Oribi, graceful Impalas, and Common Zebras, all found out in the open, park-like woodland. Overnight in our lovely lodge close to the park. We set off to the park headquarters for a briefing prior to Gorilla Tracking. This is the most exciting experience of all time. The gorillas are gentle animals and it is an unforgettable experience to photograph them as they interact. But don’t forget to put down your camera to watch these gentle giants as they play and go about their daily activities. It is indeed a “once in a lifetime” moment that you must never miss. Each encounter is different and has its own rewards; you are likely to enjoy the close view of adults feeding, grooming and resting as the youngsters frolic and swing from vines in a delightfully playful display. We will also look for other primates like the L’Hoest Monkey, Mantled Guereza (formerly known as Black and White Colobus); Red tailed monkey and Blue monkey. Other mammals include the Rwenzori duiker, Caruthers’s squirrel, Bohm’s and Alexander’s squirrels, and many other species. Overnight in our mountain lodge. Over the next two days we’ll enjoy exciting wildlife drives looking for big mammals and lots of birds. One of the highlights of this area will be the boat ride on the Kazinga Channel, which is one of the best and most thrilling in Africa. This trip is one of the better places to look for African Skimmers as well as Pink-backed Pelicans, Goliath Herons, Saddle-billed and Yellow-billed Storks, and Papyrus Gonolek. This will be our best chance to get really close views of Palearctic waders that spend the winter here in Uganda. Be prepared for bird overload! Overnight in our luxury safari lodge. Today we move on to the extensive Kibale National Park, a huge area of rainforest that offers both excellent birding, as well as the greatest variety and concentration of primates found anywhere in East Africa, and is famous for its Chimpanzees. Some of the many species we will look for around Kibale include Yellowbill (or Blue Malkoha), Black-billed Turaco, Narina Trogon, Blue-breasted Kingfisher, Black Bee-eater, White-throated Bee-eater, White-headed Wood Hoopoe, Grey-winged and Snowy-headed Robin-chats, Red-headed Malimbe, Gray-headed Negrofinch, and Black-crowned Waxbill. Overnight in our lovely comfortable lodge (2 nights). We start our day with a briefing prior to heading into the forest of Kibale National Park to experience our chimpanzee tracking. This can be a quite different though equally exhilarating experience from gorilla-watching as the chimps move easily through the forest and are as likely to be sitting up in the branches as down on the ground. We spend the rest of our day birding in this wonderful rainforest. There is a good chance of encountering some special forest birds here such as Narina Trogon. Overnight in our lovely comfortable lodge. After breakfast, we say goodbye to Kibale National Park and move on to Murchison Falls National Park. Today is a mostly driving day. Murchison Falls National Park is Uganda’s largest and protects a large section of untamed savannah bisected by the mighty River Nile. It is named after the dramatic Murchison Falls where the world’s longest river explodes violently through a narrow cleft in the Rift Valley escarpment to plunge in a frothing pool 43m below. The park is perhaps Uganda’s premier wildlife destination, with an impressive list of mammal species such as Lion, Elephant, Leopard, Hippopotamus, Rothschild Giraffe, Cape Buffalo, Hartebeest, Oribi, Warthog, and the Uganda Kob, as well as a massive bird list. We’ll have two full days here to bird the variety of habitats at Murchison. Some of the many species we’ll look for during our stay here include Rock Pratincole, Black-headed and Wattled Lapwings, Red-headed Lovebird; Long-tailed, Square-tailed, and Pennant-winged Nightjars; Red-throated, Blue-breasted, Swallow-tailed, and Northern Carmine Bee-eaters; Broad-billed Roller; African Gray and Abyssinian Ground-Hornbills, Silverbird, Snowy-crowned Robin-Chat, Spotted Morning-Thrush, , and Blue-throated Wattle-eye. Overnight at our luxury safari lodge (3 nights). After an early breakfast, we will have a morning wildlife drive. In the lush Borassus grassland, we may be able to encounter elephant, buffalo, giraffe, and a variety of antelope species. We may also see some lions if we are lucky. After enjoying a packed lunch, we will then have an afternoon boat trip to the bottom of the falls and there we will be able to view huge Nile Crocodiles, big Pods of Hippos, and other wildlife. During our time here we will look for a fantastic array of birds such as Red-necked Falcon, Senegal Thick-knee, Water Thick-knee, Black-headed Lapwing, Long-toed Lapwing, Little Bittern, Goliath Heron, Saddle-billed Stork, Sacred Ibis, Fulvous Whistling-Duck, Osprey, Abyssinian Roller, and Abyssinian Ground Hornbill, Red-throated and Blue-breasted Bee-eaters. 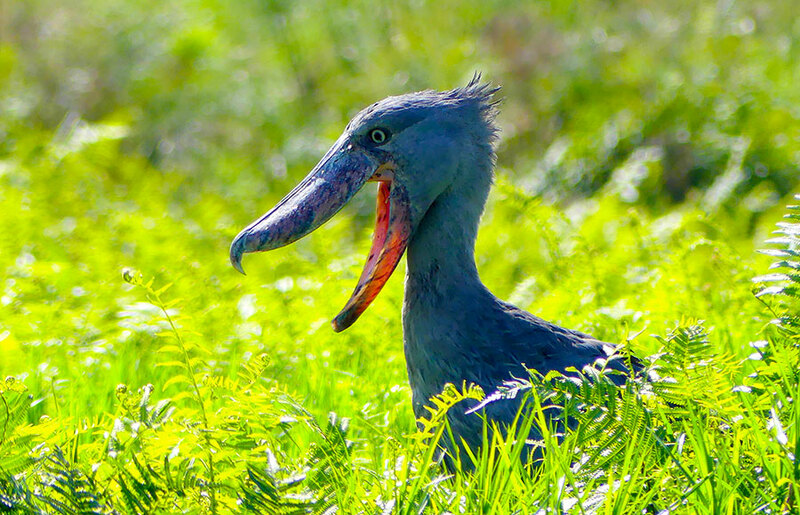 Here we may also have another chance of sighting the rare Shoebill if we are very lucky. Other birds we will look for on our wildlife drives include Abyssinian Ground Hornbill, Vinaceous Dove, Grosbeak Weaver, Buff-bellied Warbler, Yellow-fronted Tinkerbird, Bar-breasted Firefinch, Red-winged Grey Warbler, Spotted Morning-Thrush, Silverbird, Beautiful Sunbird, Black-headed Gonolek, Speckle-fronted Weaver, Golden-backed Weaver, White-rumped Seedeater, White Crested Turaco, Bruce’s Green Pigeon, Chestnut-crowned Sparrow Weaver, Northern Carmine Bee-eater, Pennant-winged Nightjar, Standard-winged Nightjar, White-rumped Canary and more. Expect a lot of birds! Mammals include hartebeest, oribi, Uganda kob, elephant, giraffe, bushbuck, buffalo, lion, leopard, spotted hyena, jackal, mongoose and more. Overnight at our luxury safari lodge. We say farewell to Murchison Falls National Park and make our way back to Entebbe, making several birding stops along the way. Our tour ends at Entebbe in time for evening flights home. There is an option for guests to stay an extra night in Entebbe before flying home if they wish; please note this is not included in the price. A hotel room will be made available for guests wishing to freshen up before going to the airport, with the transfer to the airport provided. Our exciting tour includes: 15 days’ guided bird- and mammal-watching; 14 nights’ accommodation on a fully-inclusive basis in very comfortable hotels and lodges with ensuite rooms throughout, close to the best wildlife areas and often actually within the national parks; guiding by Alan and Ruth and an expert English-speaking local guide (the very best guide in Uganda!) throughout the trip plus additional local guides at specific birding locations; transport in a comfortable air-conditioned vehicle during the tour; all excursions as itemised in the itinerary; all entrance fees, gorilla and chimp tracking permits already included; all meals (breakfast, lunch and evening meal) from evening meal on Saturday 29 February until lunch on Saturday 14 March; bottled drinking water throughout the tour; use of our field guides; use of our top-of-the-range Leica telescopes; airport transfers to/from Entebbe airport at the start and end of the trip; individual checklists of the birds, mammals and other wildlife we will be looking for. We will run this tour with six participants only and three guides, ensuring that everyone has the highest levels of individual customer service and the best possible wildlife-viewing experience. We want you to have the most enjoyable wildlife holiday on your Birdwatching Trip with us. All tracking permits are already included to guarantee your gorilla and chimpanzee tracking experiences. The price does not include: international flights to/from Entebbe airport; visa; personal travel and medical insurance; medication; alcoholic drinks; any additional drinks or snacks; any items of a personal nature; tips for local guides and driver, gorilla and chimpanzee rangers and trackers. While we are not able to book flights for you, we work closely with Trailfinders to arrange the flights for our long-haul tours so that they can offer you the benefit of their best possible prices and ABTA bonding. We are very happy to advise you on your international flight arrangements. Difficulty: This tour includes some quite long hikes over uneven and sometimes steep terrain. Payment: By cheque or electronic bank transfer. We ask for 20% deposit upon booking with the balance due by 70 days before travel. Full details are provided on our Booking Form. Please ensure you also see our Terms and Conditions and Booking Confirmation Statement. We are compliant with the Packaged Travel Regulations 2018 and have Financial Failure Insurance in place. Participants: This tour will run with a minimum and maximum of six guests. The tour will go ahead provided six guests have booked by 70 days before the start of the tour. Visas: Tourist Visas are required for visitors to Uganda. Please see https://visas.immigration.go.ug/ for details and application. Travel and medical Insurance: Please make sure you have the correct insurance cover in place for this tour before the start of the trip.